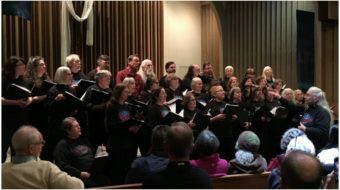 OREGON CITY, Ore. (PAI) – On Oct. 13, union painters held signs outside the South Waterfront headquarters of Reach CDC, a non-profit developer of low-income housing. Reach hired general contractor R&H, which in turn hired Edwards Painting, a non-union contractor which spectacularly broke labor law. And National Labor Relations Board (NLRB) administrative law judge John McCarrick didn’t hold back in his verdict on Edwards. The firm violated federal labor law 18 separate ways, McCarrick ruled, and now must make amends. Edwards Painting is a family-owned company in Oregon City that specializes in interior and exterior painting of multifamily residential buildings. In January 2014, owner Gene Edwards told an NLRB agent he’d shut down the company before he’d go union. But McCarrick ordered the company to hire seven union painters, pay them back wages with interest, and read the order in English and Spanish to his assembled employees in the presence of an NLRB agent. “I found Grant Edwards to be one of the most incredible witnesses I have observed in over 29 years as a judge,” McCarrick explained. Gene Edwards acted as if his company would be immune to the law’s effects. He and his family went into a 5-day hearing without an attorney, and made such a mess of the proceedings that the voluminous transcript is full of dark comedy, like when the company denied it engaged in interstate commerce, or argued that the Painters Union is not a labor organization. During the trial, McCarrick repeatedly made allowances for Edwards’ lack of legal experience. But in his decision McCarrick seems to have lost patience with Edwards’ thumbing his nose at the law. 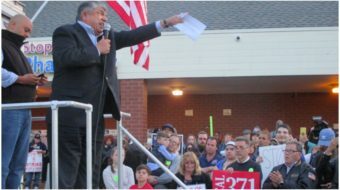 The National Labor Relations Act’s key Section 7 says employees have the right to self-organization, to form, join, or assist labor organizations, to bargain collectively through representatives of their own choosing, and to engage in other concerted activities for the purpose of collective bargaining or other mutual aid or protection. And it follows that provision with language saying it’s an unfair labor practice for an employer to interfere with, restrain, or coerce employees in the exercise of those Section 7 rights. Keep that in mind when you consider that Edwards Painting, more specifically Gene Edwards and wife Connie and sons Grant and Bob interrogated employees about union activities on numerous occasions, and threatened to lay off or terminate employees if they signed a union petition, attended a union meeting, or voted for the union. The Edwards’s also promised a wage increase – and work throughout the winter – if the workers would cease union activities; and told workers their working conditions would improve if they removed their union T-shirts. They told workers the union is mafia, an organization trying to steal their work, and ordered workers not to hand out union fliers at a work site. Then they called the police because employees were distributing union fliers, ordered union supporters off the property while other employees stayed behind, and told workers the company is not and would never be a union shop. 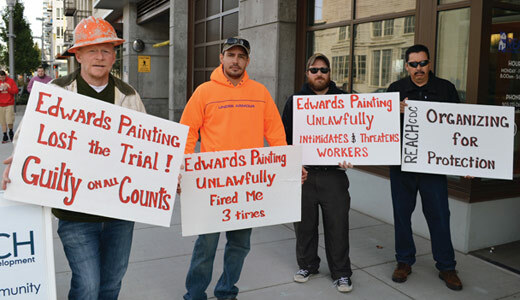 The Edwards’s told job applicants that the company doesn’t hire union painters. They hired less-qualified non-union applicants after refusing to hire qualified union applicants. And that’s not all. The firm isolated pro-union workers, failed to assign work to them, and terminated four employees for engaging in union activity. They even opposed a fired employee’s claim for unemployment benefits, after swearing he wasn’t fired, just laid off for lack of work. And that doesn’t even touch on the drug use accusations and the death threat and biker gang connections, none of which the Edwards were accused of but which featured in the case. The story began in the summer of 2013 when the vehemently anti-union business – and low-road employer – unwittingly hired one union organizer and three other union members. The whole saga is detailed in McCarrick’s 48-page decision. You might be tempted to feel bad for the Edwards clan. They did a bad thing or 18, but they’re not bad people. They didn’t know the law. They’re a construction firm without a written drug policy. They don’t keep any formal attendance records or even personnel files or written records that document the reasons for employee discharges. But the son outdid his father: “I found Grant Edwards to be one of the most incredible witnesses I have observed in over 29 years as a judge,” McCarrick wrote. As of mid-October, Edwards Painting had not complied with any elements of McCarrick’s order. All seven fired workers or discriminated-against applicants told the NLRB they want reinstatement or to be hired. Edwards works for prominent general contractors including R&H, Walsh, and KeyWay. Members and staff of the Painters Union District Council 5 reacted to the order with a stepped-up campaign to inform developers that they’re employing a company that violates federal labor law. That included the October 13 demonstration.